On October 12, 2003, at the Soho Playhouse in Greenwich Village, NYC, Joy Dewing married Noel Katz. The entire ceremony was an original musical by Noel Katz with singing Bride, Groom, Preacher, Best Man, Bridesmaids, sister, Flower Girl (age 4), and all four parents of the couple. Yes, it was a real wedding, and yes, everyone who attended sang. The original cast live recording is available on CD for $20, free shipping in the USA. Use PayPal to send $20 to Noel Katz, say what address it’s going to and it’ll be in your hands within a week. Similarly, sheet music from the score sells for $7/song and is e-mailed to you as a PDF. Noel’s Musings on Musicals blog has discussed the show every anniversary: 2011, 2012, 2013, 2014, 2015, 2016, 2017, 2018. He wrote it for his marriage on Oct. 12 to Joy Dewing, 29, a musical-theater coloratura he met in a theater-related Internet chat room six years ago. Like characters in an updated version of ”She Loves Me” (”except that we never hated each other,” Ms. Dewing said), they found their correspondence becoming more personal. After Ms. Dewing visited Mr. Katz in Manhattan, the couple began an eight-month long-distance relationship, which culminated with Ms. Dewing moving to New York. And so he went to work. ”Our Wedding: The Musical” had its one and only performance before 150 guests at the SoHo Playhouse in New York. The stage was bare except for an electronic keyboard. Several in the cast of 14 were family members, including the couple’s parents, none of whom had ever sung in public. The show had some up-tempo numbers and raffishly rhymed riffs, but it had no showstopper about getting to the church on time and no real drama. 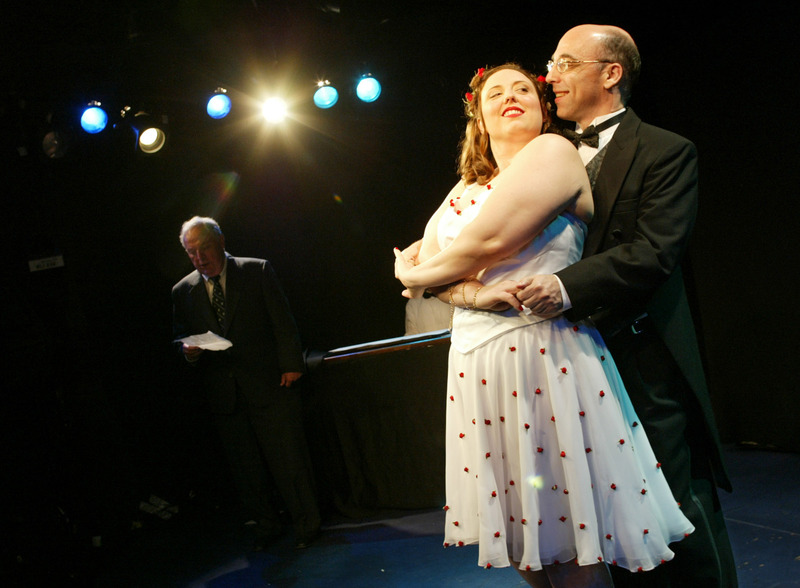 From the opening, it was clear that the leading man, Mr. Katz in a black cutaway, and the leading lady, Ms. Dewing in a white top with a short white and red skirt, would end up with each other. 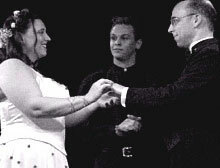 They became husband and wife onstage about halfway through the performance. Naturally, the Rev. Matthew Hamel, the Baptist minister who officiated at the legally binding performance, had a long list of theatrical credits, including ”My Fair Lady” with Ms. Dewing. But this was his first role written to order. ”Noel took lots of notes,” Mr. Hamel said, ”and was very cautious, asking me, ‘What do you want to do? What do you have to do?’ I told him I do need to ask if they take each other in marriage and I have to hear them say, ‘I do.’ ” But Mr. Hamel said one timeworn line was not required, the one about speaking up against the union now or forever holding your peace. That was not what Mr. Katz wanted to hear. ”He was like, ‘I want to use it as a joke,” Mr. Hamel said, and Mr. Katz did, in a four-line recitative that brought down the house when Mr. Hamel sang it. You better have a damn good song ready! As for Ms. Dewing’s solo, she rejected the first three versions that Mr. Katz wrote. He makes the winter summer, and the summer endless. Yesterday marked the first anniversary of a one-performance-only show and a marriage. While Katz was writing shows, he was looking for love, which he eventually found back in 1997 — on the Internet. Dewing was an actress who logged on to seek information about such musicals as The Boy Friend, not knowing that she’d indeed find The Boy Friend. Before you could say “Will he like me when we meet?” Noel liked Joy when they met. But Katz had learned from the cast album of Jamaica to “Take It Slow, Joe,” and he did — not proposing until December 2001. After that, Our Wedding took a mere 22 months to be written, cast, directed and produced — which, as we all know, is pretty fast in these theatrically challenged times. Dewing, who’s been Mary Magdalene in two different Jesus Christ Superstars and many a nun in The Sound of Music, was happy to originate a role that she hopes no one else will ever play. Our Wedding opened with a chorus of five: Best Man (Sandy Schlecter), two Maids of Honor (Keara Rebecca Collier and Lauren Kaye Furjanic), and two bridesmaids (Cristen Leigh Marshall and Shelley Anne Work). To a bright, Jerry Hermanish tune, they asked the musical question, “Why Does It Have to Be a Musical? / Just to be out of the norm? / Why embarrass your mothers / And all of the others / By forcing us all to perform?” But Jillian Katz Pierson, Noel’s sister, explained why in “There Ought to Be a Song.” Seems that the Katzes were a most musical family. As Jillian sings, “When a tragedy would come our way / We met it with a song.” As she later pointed out, “When our mansion had a smoky fire / Then we convened the family choir / Dousing flames by raising voices higher.” Noel smartly modulated the music on the word “higher.” Jillian later also related a most personal incident: “When a dog knocked out my two front teeth / I thang a thilly song / I was rushed to a dentist, and ‘Caps!’ said he / Noel cheered me with a rhapsody.” Neat rhyme, no? And you should hear Jillian’s smash performance of the number. The ladies’ insouciance came to end when The Right Reverend Matthew Simms Hamel took the stage. He didn’t turn out to be a Dr. Brock-like sobersides but, rather, a pretty cool Baptist; he led a choir of 10 in “Say Amen!” (“They’re a blessed couple / I declare / Dontcha all think they / Stand a prayer?”) It’s a number that, midway through, the audience greeted with a clapping-in-rhythm response. 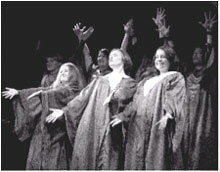 Alas, from the CD, I can’t tell if The Right Reverend encouraged them to join in by stretching out his arms as far as they’d go and clapping while vigorously nodding his head, the way some inferior entertainers do when they need applause from an audience. But considering how felicitous the tune is, I’d say that the crowd clapped in rhythm simply because they were enjoying the song. Then we heard, “This Bud is for you.” Lest you assume that the booze-filled reception had already started, the line was sung by Taite Rose Pierson, the four-year-old flower girl. In this 46-minute musical, her 46-second song was a definite highlight, and it gave the bridesmaids a tough act to follow as they performed the processional. That’s when the bride and groom took the stage together to sing “How Could They Have Missed?”, in which they each ruminated on the other’s previous dates. Noel wondered, “How could they have missed your beauty?” while Joy pondered, “How could they have missed your humor?” This was followed by The Right Reverend asking in recitative, “If there’s anybody here who knows any reason why these two should not be married, you’d better have a damn good song ready.” No one did, so Noel and Joy said their “I do’s” as readily as Michael and Agnes in the 1966 Jones-Schmidt musical. But unlike those two, who foolishly believed that “You can throw away your ev’ry care and doubt / ‘Cause that’s what married life is all about,” Noel’s song acknowledged, “And during times of troubles / And there will be troubles / We won’t give up” — all set to a lovely waltz.After they kissed, they threw musical comedy wisdom to the wind by following that ballad with another one. (Hey, Funny Girl got away with it, so why shouldn’t Our Wedding?) But a waltz is a must for a first dance, and all went well until Noel ‘fessed up mid-song that he didn’t know how to dance. That’s when his father, Arthur Joel Katz, came in and coached, “It may seem impossible to do it with grace / You may feel impossibly out-of-place / But wipe that embarrassment off your face” — for indeed, Noel was in the midst of many well-wishers who didn’t care if he wasn’t ready for Tulsa’s Astaire-bit. Given that Noel’s father had a song, it was only fair that Joy’s father get his moment at the SoHo Playhouse. To a tune that reeked of baby-boomer rock ‘n’ roll, Randy Dewing sang, “This Is My Night to Howl,” though he took the time to warn his brand-new son-in-law, “But if you don’t treat her right / You’ll not only know my bark, but bite.” Then came the song by the Best Man, the aforementioned Sandy Schlecter. What you may not have inferred is that Sandy is actually a woman, but she’s so dear to Noel that he non-traditionally cast her in the role. Her song, “We’ll Be There,” was a mini-history of their lives together. “When you finally lost your virginity, I was there,” she sang, before clarifying, “Well, I don’t exactly mean I was there, but you told me about it.” And after Joy summed up the event by singing “This Man Loves Me” — which concluded with the most apt, “You can hear it in his music” — Schlechter offered a reprise of “We Were There,” with the 150 wedding guests joining her on the line, “Until the end of time, we’ll be there.” And you can be, too, via compact disc. Understandable. One of the measures of theatrical success is how long a piece runs. Cats, A Chorus Line, Grease, Fiddler on the Roof, Oklahoma!, Phantom, Les Miz, and so forth. But that is to accept the idea of success based on the number of people reached. The show of which I write, as I say, played one night (October 12, 2003) and in a small off-Broadway theatre at that. But it was one of the most successful evenings of theatre I’ve enjoyed in recent months. It was called Our Wedding – The Musical, and it was both a real wedding and a musical. 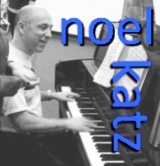 Noel Katz, the groom, is a composer-lyricist. The bride, Joy Dewing, is an actress-singer. They both love musical theatre. So when they decided to get married, they decided to shape the celebration of their love through a form they love. “Why must your life be a musical? Just to be out of the norm? By forcing us all to perform? But singing in unison – this is worse. So, why does this have to be a musical? That line about “forcing us all to perform” reflects the truth. All the principle figures in the ceremony did indeed perform. He’ll know my bark as well as my bite. The show continued in this vein with an exchange of love songs, a touching ballad that Noel sang during their first dance, and a showstopper for Noel’s female best man, about how, in a lifetime of friendship, they had always been “There” for each other. The show lasted an hour and built to a reprise of “There” that featured the repeated phrase, “We’ll be there,” that the audience easily picked up and sang when cued. At this moment, we went from watching the show to becoming part of the cast. At the end, of course, a curtain call (talk about a guaranteed standing ovation!) followed by a cast party in a Greenwich Village institution, a former speakeasy called Chumley’s. The critic Robert Brustein has written that, because theatre is a social form, it is natural that presentations may be categorized by their attitude towards the audience. Brustein thinks that the two poles of attitude are works that challenge the values of their audience and works that celebrate them. Most of the landmark works of what we like to think of as the modern theatre fit into the challenge category. The standard-bearer for this movement is generally thought to be Henrik Ibsen, the Norwegian playwright who relentlessly questioned various corner of middle-class life. Enemy of the People exposed capitalism’s drive to make money even at the expense of the health of the community, Ghosts dealt with venereal disease as an expression of hypocrisy, and A Doll’s House was the first major drama to suggest that women should have the full rights of citizenship. It would be simplistic to suggest that the theatre of protest speaks and the theatre of celebration sings, but generally musical theatre has produced a larger share of works offering the audience more support and encouragement than criticism. Though Oklahoma! has some surprisingly sophisticated things to say about citizenship and when people are ready for self-government, ultimately it expresses its faith in the essential integrity of the American character. The Music Man may make mild fun of stiff-necked Iowans, but ultimately it is a story of both personal and social redemption. Even that tough old bird of a show Gypsy suggests the possibility of reconciliation between the generations at its final curtain. We need both kinds of theatre. We need the works that shake us and shock us into seeing where we are betraying the ideals to which we give lip service, but we also need the works that express those ideals and encourage us to live them. A wedding is a celebration to begin with, and, by structuring theirs as a musical, Noel and Joy employed a celebratory form to express it. Cameras and microphones were present. A lot of weddings produce souvenirs in the form of photo albums and videos. This is the first I know that will produce an original cast album.